User can search story they want to with ease as system has two ways of searching. Search for Release Planning Items through Name or User Story Code. User can search the stories in the backlog with ease by the advance search functionality. If a user wants he/she can search only in Release Backlog stories or only in Unassigned User Stories with advance search functionality. With Advance search user can search by status, tags, types of story, Priority type, team, resource etc. 1. 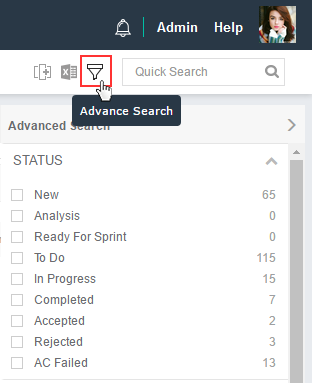 Click on Advance Search icon. 2. Search as per your criteria.